If you’ve spent any time on Pinterest, you’ve probably come across a thing called “nice cream.” If not, don’t get too excited. 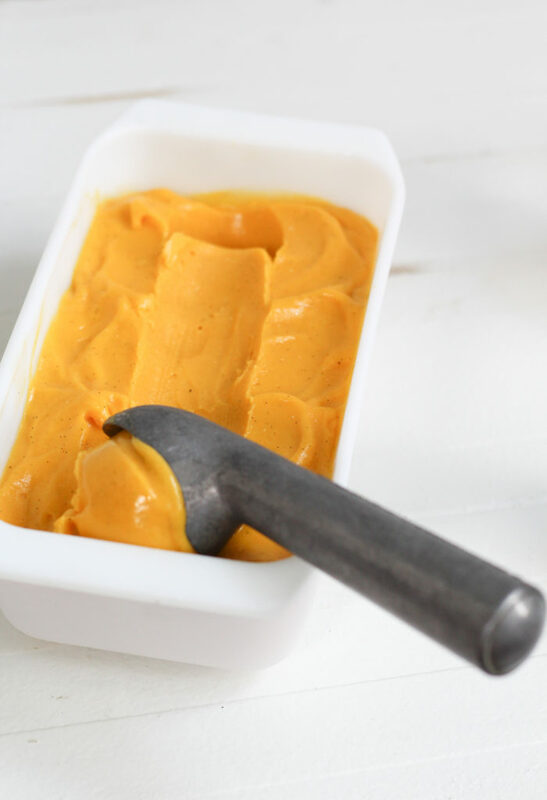 It’s just frozen bananas blended into a creamy, sort of ice cream-like substance. You can doctor it up with cocoa powder and call it chocolate nice cream. There’s even a nice cream machine out there in case you would like a dedicated appliance for this task. But no matter how you make it or what you add to it, it’s gonna taste like bananas. If you like chunky monkey, it’s perfect for you. I’ve only had chunky monkey once, by accident, because I was a kid and thought it sounded fun and no one explained the name. I was so disappointed. I wouldn’t choose banana anything for dessert. I’ll eat them, but they will never be my favorite fruit. But you know what is my favorite fruit? Naturally, the king of fruit, the greatest fruit on earth… yes, mangos! 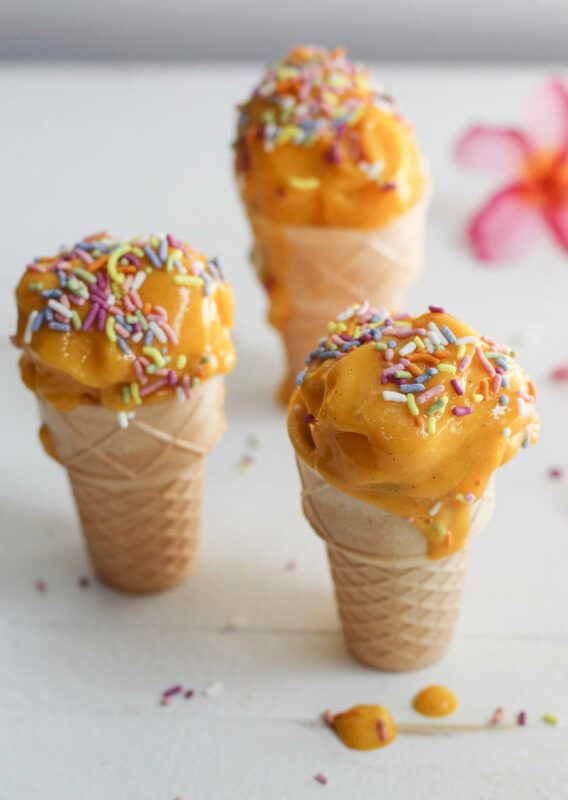 And it turns out that same idea of an all-fruit, super creamy, healthy-ish ice cream without using an ice cream maker is totally possible with them. I’m glad I finally figured it out, because we are loaded with them right now. We got a bumper crop from our late-season Keitt. We’re still eating them fresh every day and I’ve got tons in the freezer. 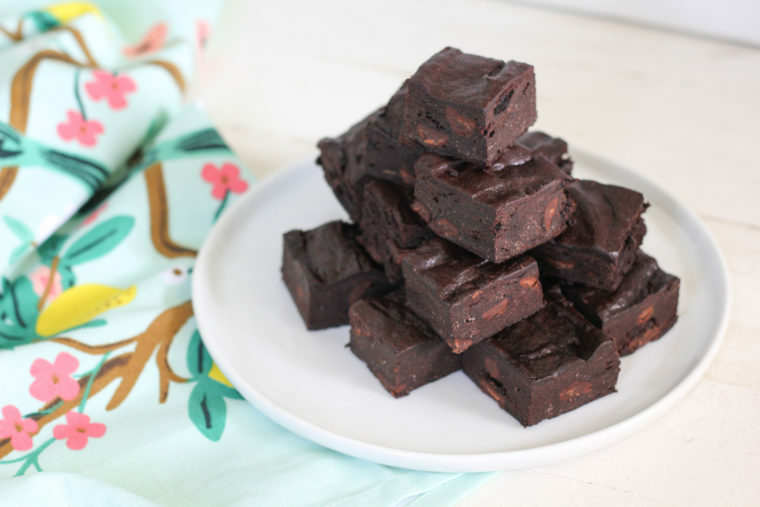 This recipe is now my top way to use them up. I’ve found a couple tricks that make it scoopable and dreamy like actual ice cream. 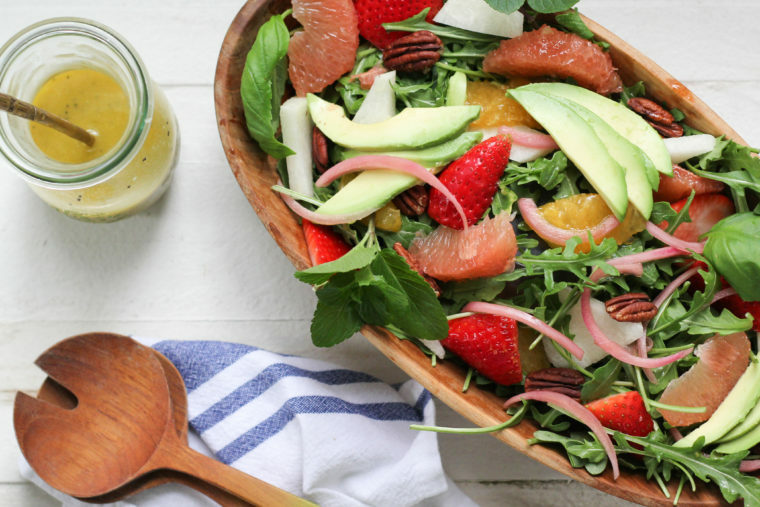 First, a high-powered blender like a Vitamix or a food processor works best. 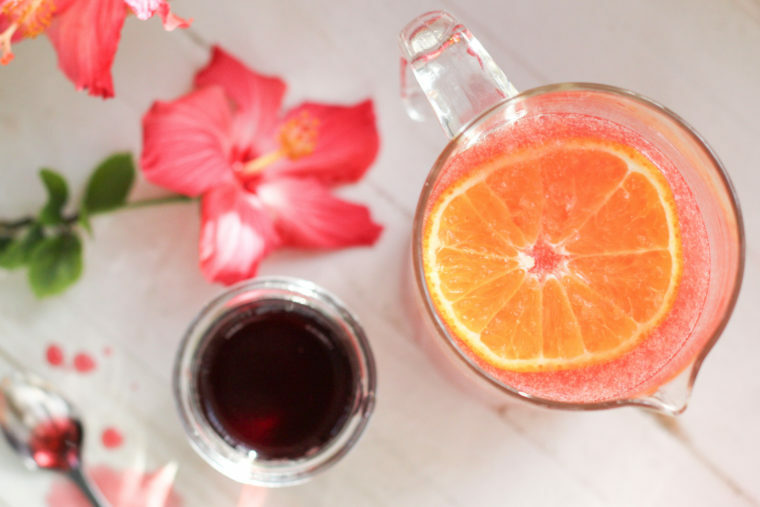 We’re blending frozen fruit with very little liquid, so you need a powerful motor. If you have a standard blender, you’ll have to add more coconut cream. I also add a vanilla bean, because that smell reminds me of an ice cream shop and it takes the mango flavor to the next level. 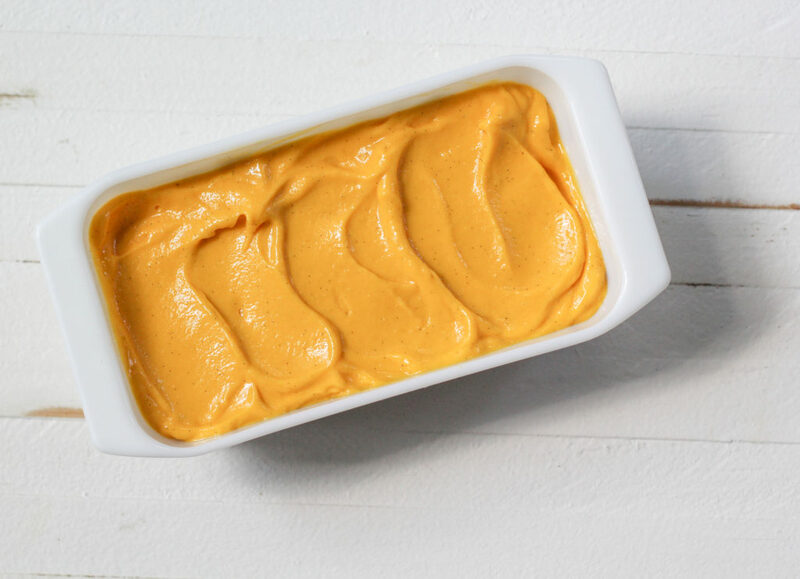 The other trick is to smooth the blended mango in a loaf pan, that way you can get a good long scoop. 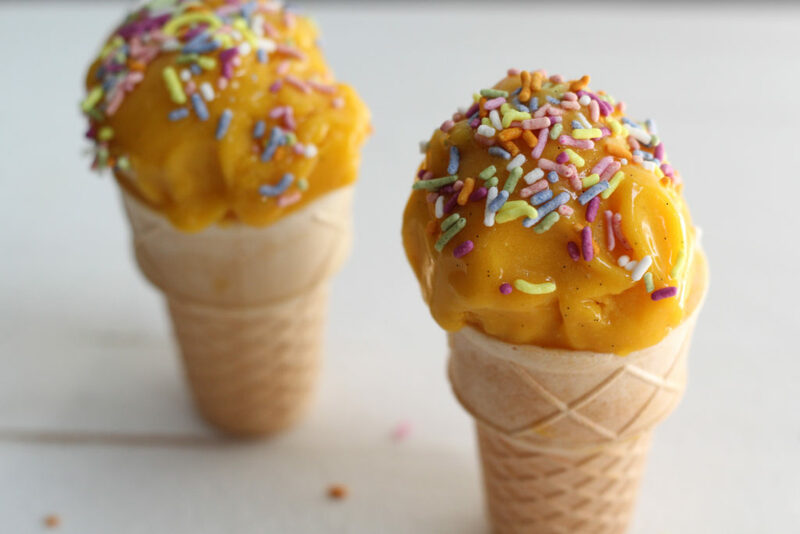 Go for a cone and sprinkles for the complete mango ice cream experience. Better than chunky monkey any day. 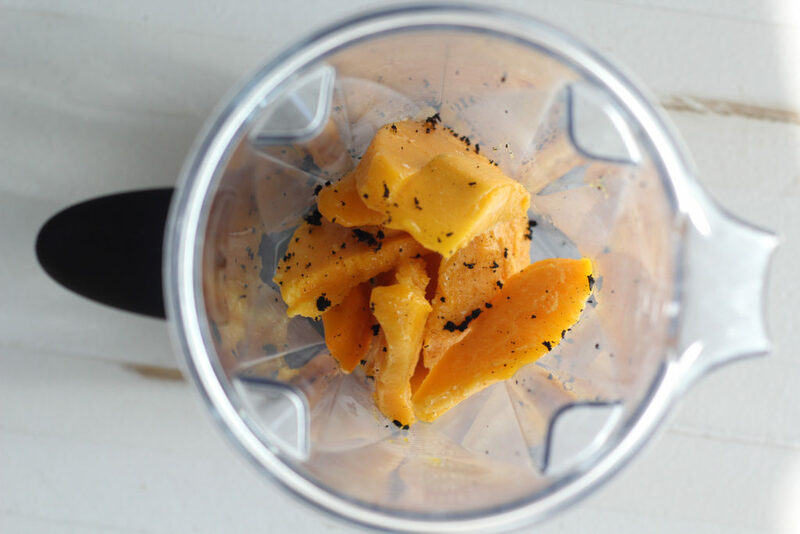 Place the mango chunks in a blender or food processor. Slice the vanilla bean lengthwise. Use the tip of the knife to scrape out the insides and add it to the blender. Add 2 tablespoons of cold coconut cream and a pinch of salt. Blend until smooth. If it's too difficult to blend, add more coconut cream. Scoop out the contents of the blender into a loaf pan. Smooth out the top with a spatula. Pop it in the freezer. After about 4 hours it should be perfectly scoopable. Once it's been frozen for longer, allow it to sit on the counter a few minutes before scooping. For storing, press plastic wrap directly over the top of the ice cream to prevent ice crystals from forming. *you can buy coconut cream or use full-fat canned coconut milk, refrigerated overnight. Open the can without shaking it and scoop the cream from the top. What a great idea! 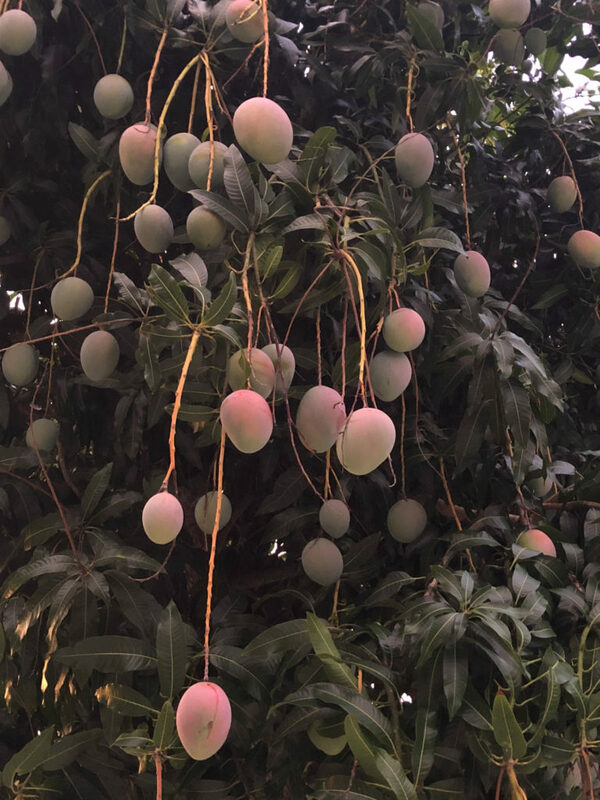 I have the best mangos ever….thanks for sharing your crop. I will definitely be making this. I’m so glad you like them! Thanks for convincing me to finally get a Vitamix, by the way. It really is awesome. That makes my mouth water just looking at the pictures! What a gorgeous color too! Can’t wait to try this! I have lots of ziplock bags of frozen mango pieces in the freezer ready to be eaten. I look forward to the year my Keitt is so productive – I will be patient. Fortunately, I have plenty of other trees that keep me supplied, although not this late in the year. Once that Keitt gets going your mango season could last half the year! You know what I’m excited about? 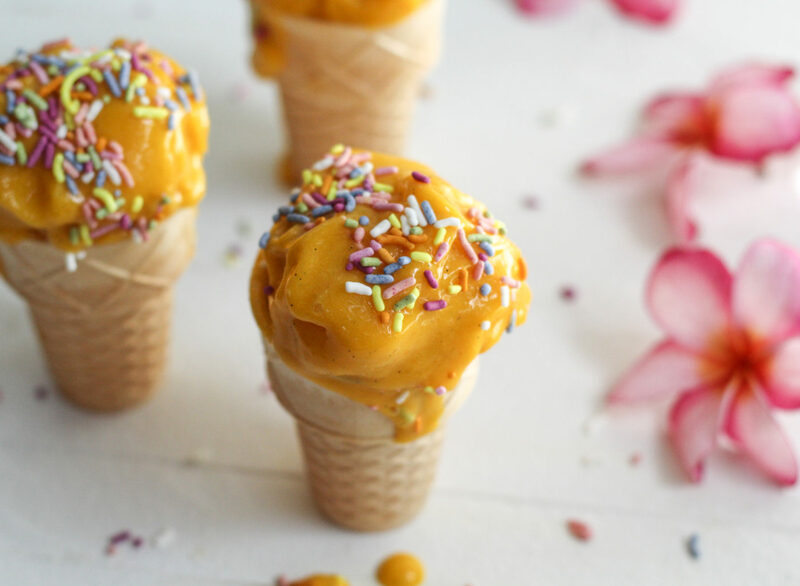 Making mango ice cream with ice cream mangos! We planted the tree you gave us and so far so good. Thanks, Lynne! I made it yesterday, so easy. Dennis and I both thought this was delicious! Thanks for the recipe! Thanks, Jenn! Glad you guys liked it.